eat, drink & be vegan: So Good To Win! I have a giveaway today! This one is offered up by So Good Canada, and two winners will receive $25 in vouchers for So Good products! 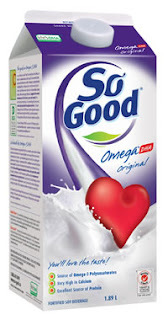 So Good has a line of non-gmo soy milks, including an Omega DHA milk, which offers a source of vegan (algae-based) DHA. They also have flavored milks and snack-packs, as well as a line of non-gmo soy ice creams. This contest is open to Canadian residents (except the province of Quebec where So Good is not sold). To enter, simply add a comment to this post. I'll randomly choose two winners and announce it sometime this week in another post (stay tuned)! fyi, So Good is also hosting a holiday recipe contest (chance to win 1 of 3 KitchenAid Artisan Stand Mixers)! Pop over to their facebook page for details. Oh man! I love So Good! we could always use more soymilk ;) thanks for the chance to win!! Can being the first person to comment (a first for me!) be a good sign? I hope so! So Good products are delicious. I bake with them all the time. This would be perfect to win!!! I love So Good! I have never had cow milk since and will never go back. I even got my whole family turned onto it. Small steps, small steps. So good is excellent! Thanks! Must try them.. I'm normally a Silk girl, but always willing to try other things! Always willing to try something new. Normally, I am a Silk girl. YAY! So good rocks. Their nog is lovely over the holidays! Thanks for a Canadian contest, Dreena! You rock! We don't drink soymilk because we have never found one that we like. But we've never tried the So Good brand so if we win we'll have a good reason to give them a try! I'd actually really like to find a soymilk that we all like that has DHA in it so this would be perfect! Oops, the Me! Me! comment was by me, Vicki! Forgot to log in! So Good is so good! Would love to win some yummy So Good! Crossing fingers! So Good! Yes please :) This was the first soy milk I ever had! Hei, we have that soy milk in New Zealand too! For once I see a Vegan product that I can recognize! A giveaway *just* for Canadians!? I'm more of an almond milk girl, but I would love to try the new DHA fortified So Good milk. Thanks for the chance to win. so good is so good. i guess they don't sell this in the states huh? Sounds like a great product line! What a wonderful and practical giveaway!